Our Australian friends over at BackupAssist have been working hard to make sure v9 is the best release yet. They could however, really do with your help in testing the Beta version (released this morning) to make sure it’s as good as it possible can be come the final release. As the distributor we like to provide as much feedback as we can, but we also rely on the fantastic response we always receive from customers and partners to help make sure we’ve got the broadest testing base. Please note – As a beta product, we do not recommend using this version of BackupAssist v9 on live or production machines. What’s new in version 9.0? NEW – Hyper-V Tab: BackupAssist v9 will automatically detect when it’s installed on a Hyper-V Server, and display a new tab in the User Interface. The Hyper-V tab makes your life easy by giving you fast, clear-cut control over your Hyper-V backup environment. NEW – Rapid VM Recovery: The Hyper-V Advanced Add-on now includes Rapid VM Recovery, a brand new feature that allows you to quickly spin up a Hyper-V guest on its backup destination. Minimize downtime in a disaster scenario by getting critical systems online in seconds before your full recovery is undertaken. NEW – Bootable Backup Media: In BackupAssist v9, you can choose to make any image-level backup to external drives a recoverable media device. That means only one device is needed to perform a recovery – making for easier, faster recoveries with fewer moving parts. 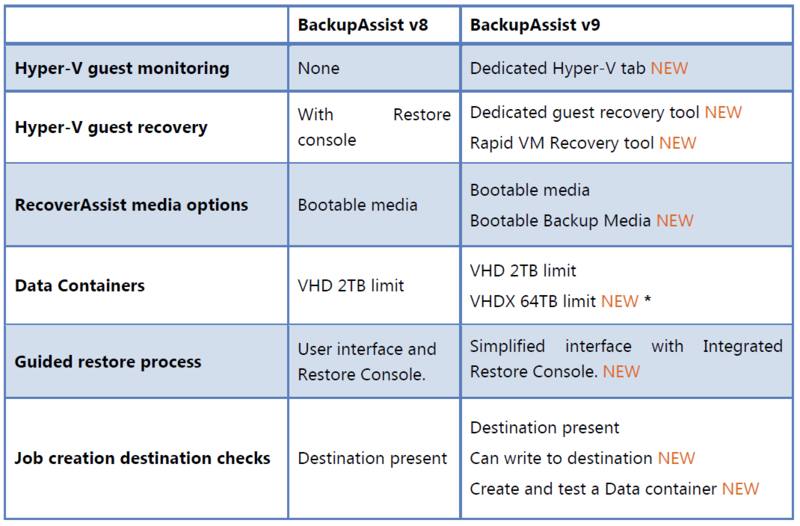 NEW – 2TB+ VHDX Data Containers: BackupAssist v9 completely supports VHDX data containers, allowing for backup sizes of up to 64TB! As your data grows, BackupAssist v9 keeps up. NEW – Integrated Restore Console: After listening to feedback from our customers, we’ve brought the Restore Console back home and integrated it into the BackupAssist UI. Not only that, we’ve given it a complete makeover – making it easier and faster to access and restore the data you need. NEW – On-Demand Analytics: In BackupAssist v9, you can perform diagnosis and verification on backup devices before the jobs run. This means you can resolve many concerns ahead of time, without needing to wait for the backup to complete. NEW – Faster image and file backups: We’ve beefed up the performance of our image and file-level backup engines. BackupAssist v9 is able to create System Protection backups at up to 30% faster speeds than previous versions, and File Protection can achieve up to 40% faster speeds! 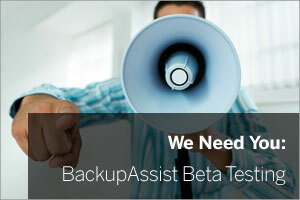 Join the Zen Software team along with our other customers and channel partners in testing the Beta release of BackupAssist. At the link below you’ll find the Beta installer along with a Quick Start Guide and Hyper-V Recovery Guide. Please share as much as you can of your findings with the team at BackupAssist (email address at link above). Many thanks in advance – happy testing!